Marshall County is a county located in the U.S. state of Iowa. As of the 2010 census, the population was 40,648. 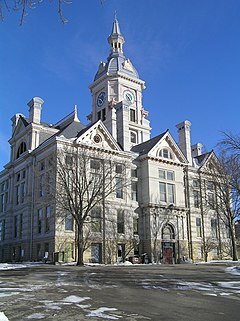 The county seat is Marshalltown. The county was formed on January 13, 1846 and named after John Marshall, Chief Justice of the United States Supreme Court. Marshall County comprises the Marshalltown, IA Micropolitan Statistical Area. In 2010, the center of population of Iowa was located in Marshall County, near Melbourne. According to the U.S. Census Bureau, the county has a total area of 573 square miles (1,480 km2), of which 573 square miles (1,480 km2) is land and 0.7 square miles (1.8 km2) (0.1%) is water. The 2010 census recorded a population of 40,648 in the county, with a population density of 71.02320471.0232/sq mi (27.42221227.4222/km2). There were 16,831 housing units, of which 15,538 were occupied. As of the census of 2000, there were 39,311 people, 15,338 households, and 10,460 families residing in the county. The population density was 69 people per square mile (27/km²). There were 16,324 housing units at an average density of 28 per square mile (11/km²). The racial makeup of the county was 90.44% White, 0.93% Black or African American, 0.35% Native American, 0.78% Asian, 0.06% Pacific Islander, 6.03% from other races, and 1.42% from two or more races. 8.96% of the population were Hispanic or Latino of any race. There were 15,338 households out of which 31.10% had children under the age of 18 living with them, 55.40% were married couples living together, 9.30% had a female householder with no husband present, and 31.80% were non-families. 26.90% of all households were made up of individuals and 12.20% had someone living alone who was 65 years of age or older. The average household size was 2.48 and the average family size was 3.00. In the county, the population was spread out with 25.30% under the age of 18, 8.10% from 18 to 24, 26.30% from 25 to 44, 23.90% from 45 to 64, and 16.40% who were 65 years of age or older. The median age was 39 years. For every 100 females there were 99.20 males. For every 100 females age 18 and over, there were 96.50 males. The median income for a household in the county was $38,268, and the median income for a family was $46,627. Males had a median income of $33,809 versus $24,063 for females. The per capita income for the county was $19,176. About 7.10% of families and 10.20% of the population were below the poverty line, including 14.30% of those under age 18 and 8.60% of those age 65 or over. The population ranking of the following table is based on the 2010 census of Marshall County. Prior to 1964, Marshall County was strongly Republican, never backing a Democratic presidential candidate from 1896 to 1960 & only failing to back a Republican candidate during those years in 1912 with a strong third party campaign by former president Theodore Roosevelt on the Bull Moose ticket. Since then, it has become far more of a swing county, having backed the national winner in the last seven presidential elections. ^ a b "State & County QuickFacts". United States Census Bureau. Archived from the original on July 14, 2011. Retrieved July 20, 2014. ^ "Centers of Population by State: 2010". United States Census Bureau. Retrieved July 20, 2014. ^ "Population & Housing Occupancy Status 2010". United States Census Bureau American FactFinder. Retrieved May 23, 2011. ^ "RootsWeb.com Home Page". freepages.family.rootsweb.ancestry.com. Retrieved 11 April 2018. ^ Promotions, Center for New Media and. "US Census Bureau 2010 Census". www.census.gov. Retrieved 11 April 2018. Wikimedia Commons has media related to Marshall County, Iowa. This page was last edited on 8 March 2019, at 19:45 (UTC).